The 2012 Ryder Cup Matches get underway Friday morning with 4 Foursomes matches (alternate-shot for you Ryder Cup newbies). To me, the most interesting part of any Ryder Cup is analyzing the pairings and match ups, looking for who might have the edge and what the captains may have been thinking. What a start to the Ryder Cup this should be. The team of McIlroy/McDowell is a major headliner, and the U.S. counters with the red hot Snedeker and top ten stalwart Furyk. We all know how much McIlory has accomplished over the last couple of seasons, but McDowell has quietly had a very impressive run of his own. His 2010 was one for the books, as he captured the U.S. Open title at Pebble Beach and clinched the deciding point in that year’s Ryder Cup. He has maintained very solid form, and was a prominent figure late into both the U.S. and British Opens this season. Both Euro’s are seasoned players (despite McIlroy’s age) and don’t figure to be bothered too much by nerves. If there is a likely spot for nerves to creep up in this match, keep an eye on Snedeker. He will be garnering more attention than ever before, and is likely still exhausted from his win at East Lake. It will be important for Furyk to use his experience and steady the U.S. team early. This is the gamble pairing from Captain Davis Love III. Both Mickelson and Bradley are explosive players, capable of making tons of birdies. They also can both get it going sideways and struggle for pars. It should be obvious within the first few holes how this pairing will fair. Going against them will be about as tough of a Ryder Cup team as you can imagine in Donald and Garcia. Both have great records in the event, and Garcia has more confidence in his game than he has had in years. With Donald’s solid all-around game, and Garcia’s explosiveness, they will be a tough test even if Phil and Keegan bring their best. I think Davis Love III made his best pairing right here in this match. Both Dufner and Johnson are very consistent ball strikers, which is crucial when playing alternate shot. Their styles will complement each other, as will their quiet and laid back demeanor. They also have a favorable match up going against the team of Westwood and Molinari. While Westwood is of course a great player, he isn’t always solid with the putter. Combine that with the inexperienced Molinari, and the Americans seem to have a great chance in this match. It’s not always about the big names in the Ryder Cup (see Woods record), but rather pairings that make sense and guys that are comfortable with one another. To my eye, this is the toss up of the morning session. On the Euro side, you have Poulter and Rose, who are great friends off the course as well as great players on it. Rose is the steadier of the two, but both have plenty of big state experience to handle going against Tiger Woods and the media circus. The fourth wheel in the group is Stricker, who is no slouch in his own right. The U.S. team probably has the talent edge in this match, but Woods wild inconsistency off the tee is going to make him a tough partner to play with in alternate shot. Stricker will likely face at least a couple ‘creative’ approach shots off of Tiger’s errant drives. In the end, this one probably comes down to a couple putts either way, as so many Ryder Cup matches do. After the morning session is complete, the players will head back out for afternoon Four-Balls (or best ball) matches. The pairings for those matches will be released during the late morning, and look for both captains to try to get most of the remaining players onto the course. For the U.S., it’s a safe bet that both long hitters Bubba Watson and Dustin Johnson will find their way into the birdie-friendly best ball format. 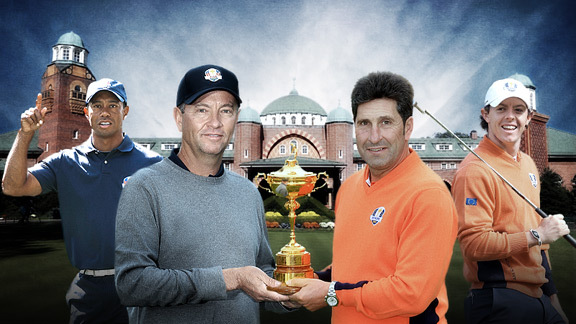 On the Europe side, look for Captain Olazabal to use Nicolas Colsaerts in the afternoon. Colsaerts is lesser known, but hits the ball maybe farther than anyone in the competition. With the lowered rough around Medinah, the best ball matches are very likely to become shootouts. Overall, I think the edge is to the European side going into the matches. They have more of the top players, and a better track record on the first two days of play. For the U.S. to take back the cup, they will need a strong showing in the best ball matches, as they never fare well in alternate shot. Should the U.S. manage to reach Sunday morning at or near tied, their odds improve greatly. Regardless of the outcome, it promises to be great theater. Enjoy the matches, and come back each day for commentary and discussion.